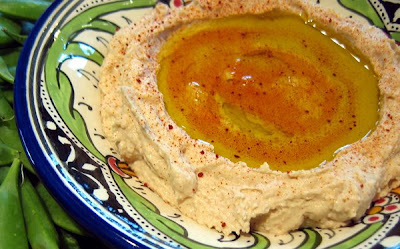 Hummus, in my view, is a much-maligned quantity. It was the barely edible, dry stuff you brought to parties in college because it was "ethnic" but in reality was a cheap way to feed your friends. And there are still very few who make a decent version, outside of Middle-Eastern restaurants like Ya Hala or Hoda's who also make their own pita bread. I'd give my own efforts an "OK" rating back then and, even at that, it was way better than most of the stuff sold at even our most effete grocery stores, which range from chemical-tasting to having that certain je-ne-sais-quoi cardboard flavor. Then all was made better by a recipe that my parents brought back from their pre-retirement sojourn in Liberia (yes, in Africa) where they met several Lebanese couples, teachers at the college they were working for. My mother, being a resourceful sort and knowing a good thing when she tasted it, begged a couple of recipes from them that she shared when she eventually returned home. Ever since, our lives and the success of many a gathering have been aided and abetted by her ingenuity. I hope you agree her efforts weren't in vain. You can make this in one step by placing all the ingredients in the food processor and processing till it all turns to a smooth consistency. Add water if necessary to keep it blending (I don't). Garnish with a drizzle of olive oil and a sprinkling of paprika (or better yet, Spanish pimenton) or the traditional sumac. The taratoor by itself makes a terrific sauce for pork or meats, or drizzle it over rice, vegetables or appetizers like stuffed grape leaves.